January 5, 2012 - Boeing booked 805 net commercial airplane orders in 2011, fueled by a late flurry of record-breaking deals. The company also delivered 477 airplanes, ending the year with a strong backlog of 3,771 unfilled commercial orders. "This past year was one of the most exciting and important years in Boeing's history," said Jim Albaugh, president and CEO of Boeing Commercial Airplanes. "By placing record orders, our customers showed their confidence in our products and the quality of work performed by our employees. "Our goal in 2012 is to ensure that 787 production is stable and reliable, while maintaining focus on execution as we deliver an increasing number of airplanes across all our programs." The 777 once again led Boeing's twin-aisle programs by setting a new record for orders in a single year at 200, solidifying the company's lead in the widebody segment of the market. Meanwhile, the launch of the 737 MAX spurred historic deals that resulted in more than 1,000 orders and commitments to date from 15 customers. "The 737 MAX, with its unmatched efficiency, will be a key part of our customers' future fleet needs. As our current commitments become firm orders and we add even more customers, I have no doubt that 2012 will be the 'Year of the 737 MAX'," said Albaugh. The Boeing 737 MAX is a new family of aircraft being developed by Boeing Commercial Airplanes to replace the Boeing 737 Next Generation family. The primary change will be the use of the larger and more efficient CFM International LEAP-1B engines. The airframe is to receive some modifications as well. The 737 MAX is scheduled for first delivery in 2017, 50 years after the 737 first flew. The three variants of the new family are the 737 MAX 7, the 737 MAX 8 and the 737 MAX 9, which are based on the 737-700, −800 and −900ER, respectively which are the best selling versions of the 737 Next Generation family. Boeing has stated that the fuselage lengths and door configurations from the Boeing 737 Next Generation family will be retained on the 737 MAX variants. Initially, the customers for the 737 MAX were not disclosed, except for American Airlines. On November 17, 2011, Boeing released the names of two other customers Lion Air and Aviation Capital Group. At that time, Boeing reported 700 commitments from 9 customers for the 737 MAX. On December 13, 2011, Southwest Airlines announced they would be the launch customer for the 737 MAX with a firm order of 150 aircraft and 150 options. 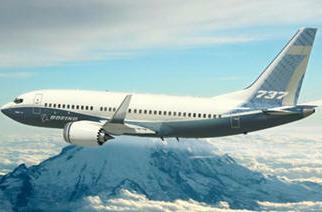 In December 2011, Boeing has 948 commitments and firm orders from 13 customers for the 737 MAX. On top of a strong backlog, the growing demand for Boeing airplanes is driving production rate increases across most of Boeing?s airplane programs over the next two years. Most notably, 737 will increase production to 38 airplanes per month (35 per month rate begins this month), 777 to 8.3 airplanes per month (currently at 7 per month), and 787 to 10 airplanes per month (currently at 2.5 per month).